He's always liked to be held while he sleeps during the day (which makes it really difficult to get anything done), and then a couple of weeks ago he started getting fussy for no reason. Well it turns out that he has reflux which is causing heartburn. That's why he spits up so much and doesn't like to be put down on his back. Now we're giving him medicine twice a day and hoping that it improves once he's old enough to sit up on his own. In the meantime, I get to enjoy lots of time holding my baby which is especially fun right after he eats because he's in a good mood. He's getting very talkative and will usually smile and squeal and coo. Of course when I got out the camera, he decided that he would rather nap than smile. He eventually did realize that I had put him down, and he woke up. He wasn't really in the mood for photographs though. I gave him his pacifier, and he tried to curl up and go back to sleep. Soooo cute. I just wish getting him to smile wasn't so difficult. 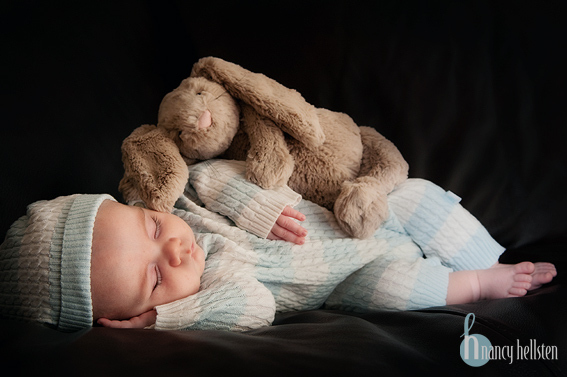 "Of course when I got out the camera, he decided that he would rather nap than smile." I wish aiming a camera at a baby was more successful in making them nap sometimes! He totally has your eyes now. Looking forward to hearing the cute noises sometime soon! I love that he's so serious in that picture. It almost looks like he was thinking, "What is she doing with that?"